Bury Metropolitan Borough Council has acquired the latest electric, ultra-quiet, zero emissions sweeper technology to keep its streets and pavements clean round the clock without disturbing residents or polluting the environment. The Green Machine 500ZE is being supplied to the council by leading contract hire and fleet management company, Specialist Fleet Services, via Green Machines who will also be maintaining the vehicle for the duration of the 5-year contract. 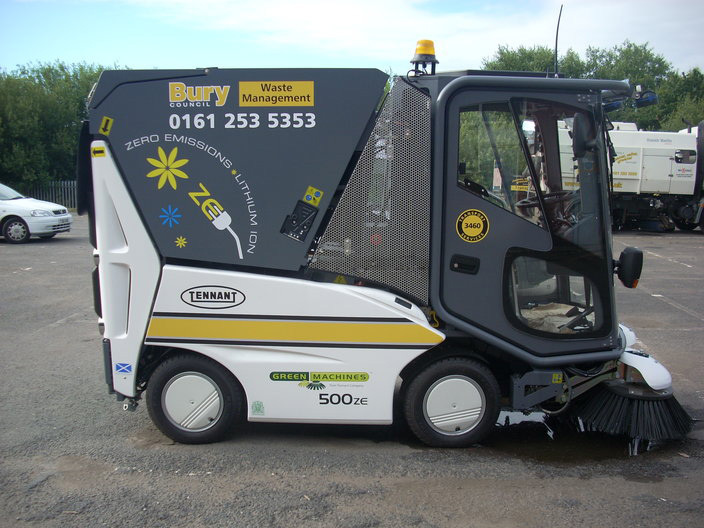 The sweeper is the second electric vehicle to join the Bury fleet. The authority also has an Mega Tipper electric vehicle to collect litter from bins in and around the town centre. Designed in Britain the 500ZE is manufactured by Green Machines, now part of the Tennant Company, in Falkirk Scotland. It is the first Lithium Ion powered suction sweeper in the world and was designed to create a cleaner, quieter sweeping solution for town and city centre areas. Virtually silent, the 500 ZE allows early morning and late night sweeping to take place with minimum impact on residents. The machine can operate for up to 8 hours, non-stop, on one charge and can recharge in just four hours. Bury MBC is installing an electric charging point at its depot for this purpose.